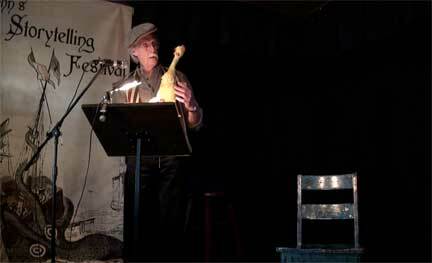 On March 15, 2011 a group of storytellers and speakers gathered at the Ship Pub in St. John’s for a marathon evening of Jack Tales. The purpose? To stitch together a folk epic. The 6-hour performance began at 5.30pm, lasted until midnight, and played to a packed house all evening. Oral storytelling is as old as humanity; telling stories a way of exploring who we are and how we dwell in the world. Throughout history, storytellers from ancient Greece to Malaysia, from Yugoslavia to Ireland have sung and told the epic tales of Odysseus, Arjuna, Cúchulainn and countless others: national epics with epic folk heroes. The Greeks have the Odyssey, the Irish Táin Bó Cúailnge cycle, the Finns the Kalavala, the Icelanders the Sagas, etc. Told or sung for hours or days, they echo the national character of those cultures. In Newfoundland what have we got? Jack. Jack is the hero of countless adventures told by Newfoundland storytellers through the centuries. Each Jack tale is usually told as a unique narrative unit with a beginning, middle and end. Previously no one has consciously tried to assemble them into the long-form story arc of an epic. Jack Tales encapsulate elements of the Newfoundland character that have evolved over five centuries: courage, cleverness, generosity, handiness, hardiness, honesty, humility, naïveté, wit, and a general belief in the impossible (amongst other traits). In the stories, Jack comes to represent the Newfoundland character. In our real history, these qualities have enabled Newfoundlanders as a people to become briefly courageous, inventive, passionate, influential, miraculous and worthy of belief. We accomplish great things, win the Bag of Gold and marry The Princess and live happily ever after… until, of course, the story ends and we are left to our benighted existence once again. We elect fools to public office, mismanage our finances, settle for cheap bargains and easy choices, argue over petty grievances, fight and bawl. We die on the ice. The Jack Cycle performance brought together storytellers, thinkers and historians for a six-hour marathon event to lay the foundation for a Newfoundland national epic. The storytellers told mythic folktales; the speakers searched for Jack in our real history. Performers alternated in their presentations, suggesting an epic form through juxtaposition rather than sequential linear narrative. The evening explored aspects of our national character via an inductive reasoning, an “inward imagining” which would coalesce in the minds of spectators to illuminate Newfoundland identity. The March 15, 2011 JackCycle whose elements you’ll find on this website is not a finished form; it is the beginning of a process to shape an epic. We hope that it may inspire others to take the process further and stage more epic tellings such as this one, that the videos on this website may provide helpful resource material, and that over time we will refine the outlines of our national folk epic. If you have any ideas or experiments to share, let us know on the blog. Now this tin table is bended, and this prologue is ended. Go to the videos of the Performers. 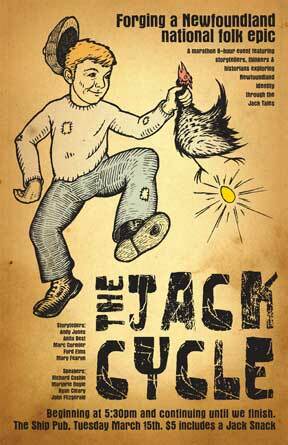 © Jack Cycle is powered by WordPress & designed by Martin Connelly.